In the Class Room - Boys and Girls - Brighton technical school, Victoria, Australia. Picnic photos were taken in 1973. 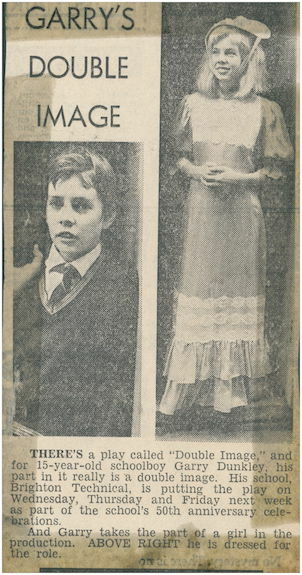 Photo of three people on the left, a girl in a long golden frock and a boy who is kneeling was taken during the 'My Fair Lady' production in 1972. Class photo, 2nd photo in this set, is Form 1A in 1969. Brighton Tech is fifty-years-old. Article refers to: Bruce and Garry Dunkley, 15, and Peter and Paul Ryan, 17 and the 50th Jubilee Review. Garry's Double Image. July 1972. Brighton Technical School 50 Year Celebration. Article refers to: Garry Dunkley. School Goes Hippy for a Day. 21 and 22 October, 1971. Article refers to: The school revue called "A La Carte" and staff members Martin Conte and Veronica Horwath. Life with a view (1969) ... Article refers to: Andrew Camm, Bruce Crook, Carol Draper, Debra Cahill, Rhonda Ingram, Mr. A. Brown and Miss Dannatt. Knock, knock who's there? (It's Rex from Illinois)... Rex is staying with the Brighton Technical School head prefect Royce Bainbridge, 16, of Prince St., Hampton. 1970.